Whether it’s Maine’s rugged coastline or Florida’s sugary sands, a beach vacation is always a family favorite. And I think having the right gear can make it even more enjoyable for the whole family, so I unearthed these finds for your next beach day. The Tillow is a 3’ x 5 ½’ beach blanket with a built-in pillow and pockets for your valuables. It’s the answer to that often-asked question: where do I keep my valuables at the beach? With the ingenious pockets, you don’t have to hide your phone and keys in your shoe only to find it full of sand later. One pocket even has a touchscreen window that lets you use your phone while it’s protected from the sand. The built-in pillow is the perfect height. My boys found it quite comfortable. In fact, my 2-year-old fell asleep on his Tillow, giving Mom and Dad a much needed break! If folds up compactly and has an attached strap to keep it that way. You’ll want one for each member of the family. Cost: $35. KidTripster Tip: Both the pillow and carrying strap are removable for washing. Ok, I admit to being a little skeptical about this one, but my son was eager to test the product. Using an old cellphone, he dunked the case in a bathtub of water. Yep, it actually works! The Aquavault 100%Waterproof Floating Case accommodates cell phones of all sizes, even plus-size models. It closes with a zip-lock mechanism and then rolls down to seal twice with Velcro. You still can use the phone to take photos and videos through the clear plastic while in the water. The case has a patented airbag which allows it to float if accidentally dropped. And it comes with a lanyard to clip on the pouch. Cost: $25. Beachmate was created by a mom and dad who were tired of schlepping stuff for their four kids to the beach. About the size of your traditional cooler, this bag is extremely versatile. Multiple beach pails and a cooler fit precisely inside, still leaving enough room for whatever else you’d like to pack. Flip the buckets over to find drink holders. Or use the buckets to store snacks so that your food doesn’t get sandy. The outside of the bag is lined with pockets which are exactly the right size for sunscreen, sunglasses, and my 2-year-old’s toy cars. My favorite feature is the beach shovels which easily clip to the outside of the bag. 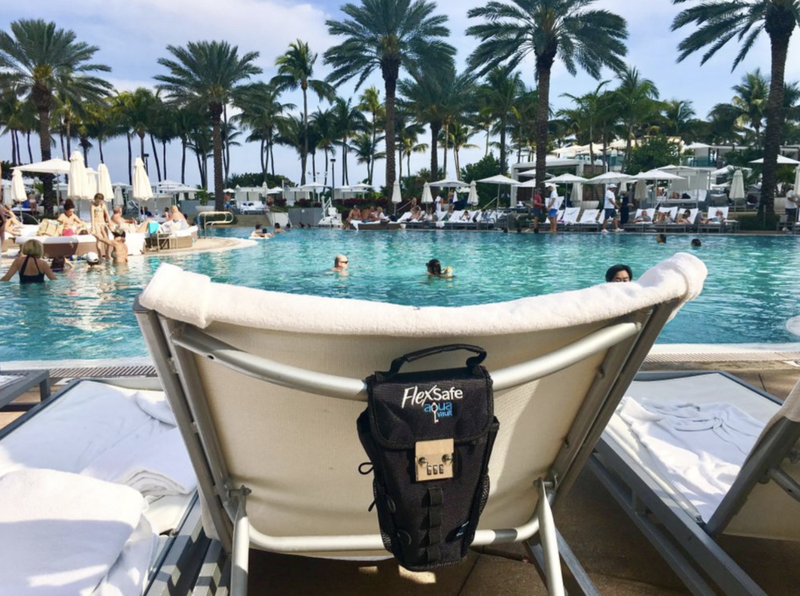 A built-in velcro strap can be used to attach towels, chairs or an umbrella. And the shoulder strap makes carrying it a breeze, even for my 7-year-old who likes to show off his muscles by lugging our family’s stuff. Cost: $75. I originally saw the creators of this product on TV’s Shark Tank. I remember turning to my wife and saying, “I totally have this problem - what to do with my phone and wallet when I’m at a water park, hotel swimming pool or beach?” I often want my cell phone with me to take photos of the kids, but I can’t ride the slides at a water park with the phone. And the lockers are typically at the entrance to the park. What a pain! Enter FlexSafe Portable Travel Safe from Aquavault. It’s a soft-sided case, designed to attach to the back of a lounge chair, stroller, bike or anything with a bar. It has a three-digit, programmable, combination lock. And it’s roomy enough to hold a wallet, phone, keys, sunglasses, and watch. Problem solved! Cost: $60. Designed by a mother of three, the Swimlid is a swim cap-visor hybrid that protects your kid from the sun. My 2-year-old often struggles to keep his sun hat on while running around on the beach or swimming in the water. When he puts it back on, he inevitably gets sand in his eyes. That’s a thing of the past with the Swimlid. Wear it on a breezy beach day, on a boat or even underwater. Made from nylon Spandex, it fits snuggly like a swim cap. Put it on and forget it. Plus, get this - the hat has built-in, UPF50+ sun protection - a big relief especially for my wife. The Swimlid comes in a variety of colors and sizes for the entire family. Cost: $13. KidTripster Tip: Have a child with long hair. Get the Swimlid with a ponytail opening. This product is one of those that makes me think, “why didn’t I think of that?” It’s the brainchild of a mom and dad in Iowa. Yes, the best beach buckets in America come from Iowa! What makes them so great? 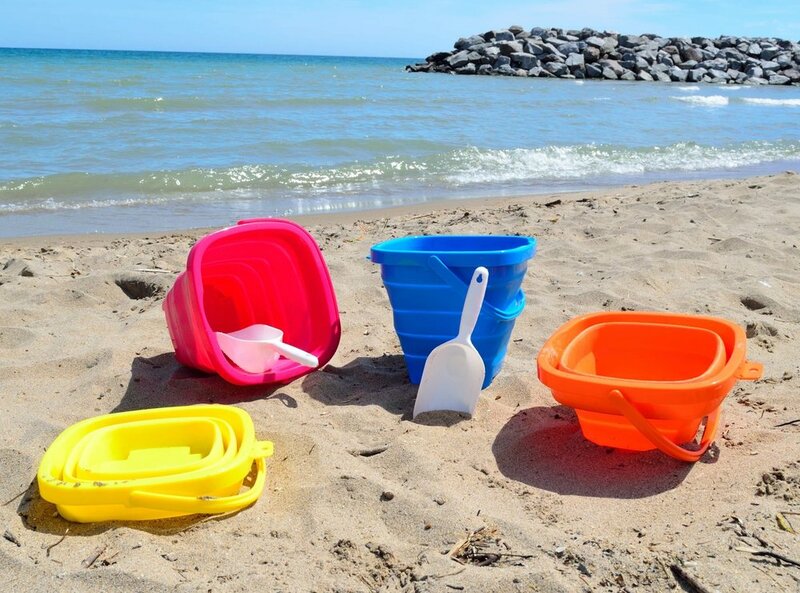 The full-sized pails are collapsible, meaning you can easily pack them in a suitcase or the trunk of your car for your next beach vacation. Cost: $20. This writer received complimentary products for the purpose of this review. However, all opinions expressed are solely his own.